A character study revolving around a surveillance expert and a conversation that he surreptitiously records between two lovers, The Conversation resonated in 1974 due to the paranoia of secret recordings related to the Watergate scandal; the film retains its value thanks to a sterling examination of the end of privacy, as well as for a defining performance from Gene Hackman and Francis Ford Copolla's edgy directing. Harry Caul is a San Francisco expert in secretly recording other people's conversations, and is often hired by powerful forces interested in eavesdropping on their opponents. With the help of his team, including assistant Stan (John Cazale), Caul pulls off a difficult assignment, recording a conversation between lovers (Cindy Williams and Frederic Forrest) meeting at lunch. Realizing that they may be followed, the couple spend their lunch hour walking around Union Square. Caul records their conversation anyway, using the latest technology and multiple static and mobile microphones. Upon piecing together the recorded conversation, Caul begins to suspect that the couple may be the targets of a murder plot. He tries to prevent the recording from falling into the hands of the client who commissioned it, a mysterious Director (Robert Duvall), who has an equally sinister Assistant (Harrison Ford), but Caul is in over his head. Soon events unfold in unexpected directions and his secretive life is shattered. Coppola, working from his own script, mixes a deliciously simmering plot with a detailed character study. 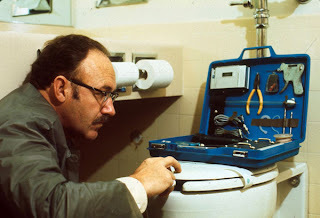 Hackman's portrayal of a careful loner intentionally detached from society and who is yet a recognized expert in his field is one of the performances of the 1970s. A man attempting to maintain a calm exterior but aware that his insecurities are too close to the surface, his buttons are pushed too easily. When his carefully constructed world begins to unravel, he does not appear to be too surprised. Caul's story is told through a plot that starts starts out in black density, as hardly any of the words of the central conversation can be heard during the recording process. Only when Caul uses his technology to piece together the words does the premise slowly start to be unveiled, but even as Coppola peels back many of the layers, the relationships and motivations that will threaten Caul's life are never fully made clear, adding to the sense of menacing behind-the-scenes forces that could choose to seep into any life. The Conversation is dark, humorless and unexpectedly intense. It ushers in the era of justifiable paranoia and lost privacy, and accurately predicts the gloomy implications for both the taped and the tapers.